Bicycle trailers expand the range of errands that can be done without a car. For some folks, bicycle trailers even eliminate the need to own a motor vehicle altogether. 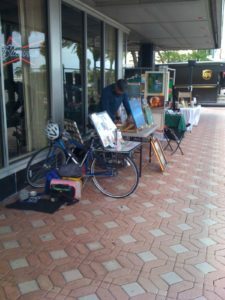 The top photo shows my art & jewelry vending setup at a little sidewalk fair a couple years back. Typically I used a little table for these kinds of events, and would carry the table and other heavy stuff on my bicycle trailer. But this particular time the rear panniers of my bicycle formed the “table,” so I didn’t need a cargo trailer. 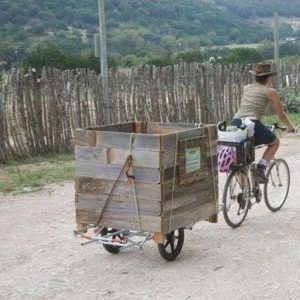 The second photo, taken about 10 years ago, shows me using a Bikes At Work trailer to transport a compost box I built for the kitchen composting operation at the Quiet Valley Ranch in Texas. 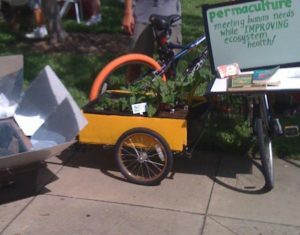 The third photo shows a permaculture booth I set up a few years back at the Earth Day festival in Ormond Beach FL. I got a local nursery to lend me plants in exchange for publicity. This past Earth Day, for my permaculture education and Deep Green book vending table, I had more stuff than I was able to carry by bicycle, so I took an Uber ride. But I wasn’t very happy with that approach; it felt sort of anti-Earth Day for my purposes. I haven’t had a bicycle trailer for a few years now but I’m looking into getting one again. My all-around favorite bike trailers are the ones from Bikes At Work. They are pricey and you have to assemble them yourself. Also they are often on back-order. Cargo capacity of 300 pounds makes it my favorite nonetheless. Hauling a mattress, a refrigerator, tubs of compost, and other large heavy items is a piece of cake with these trailers. Quite often it can be easier to haul something with a bicycle trailer like this than with a motor vehicle! They do take up a lot of space and are tricky to store in small indoor spaces, which is why I ended up getting rid of the one I had. In retrospect I should’ve kept it. My “fix” for keeping it in my tiny apartment was to have it double as a hanging rack. It was a tight fit and clashed with my girlie Bohemian decor, but otherwise do-able. My second-favorite bicycle cargo trailer is the Burley, which is super nimble and fairly sturdy (the one I had could carry about 100 pounds). They also offer models for carrying kids and pets. I used a Burley to carry my camping gear on a six-day solo bicycle ride from Austin to New Mexico back in 2007. If you’re handy and have the right tools to put together wheels and axles and that sort of thing, you could make your own bicycle trailer. In fact, wherever you live, if your skills run in this direction, I strongly suggest you look into setting up shop. I predict you will have a lot of customers wherever you are.